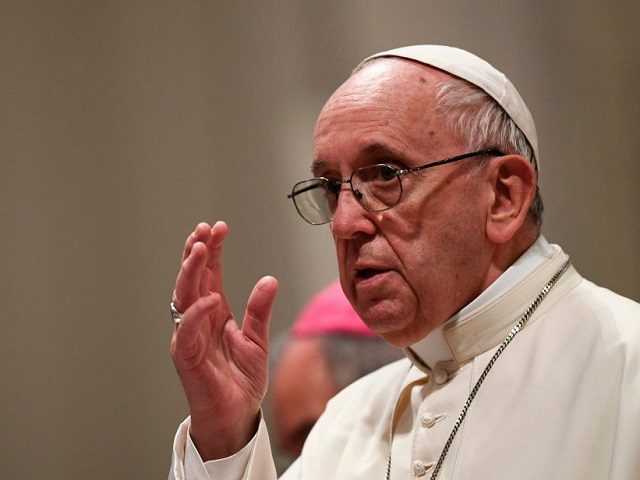 ROME– Pope Francis has sent a birthday letter to Gustavo Gutiérrez, the Peruvian founder of Liberation Theology, thanking him for his “theological service” to the Church and humanity. 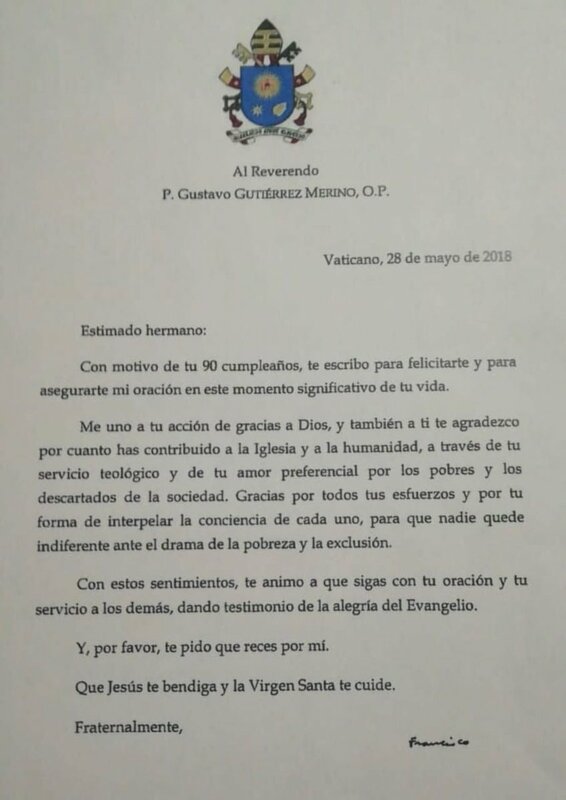 “I am writing to congratulate you for your 90th birthday and to assure you of my prayers in this important moment of your life,” Francis wrote to Gutiérrez, who is a Dominican priest. “Thank you for all your efforts and for your way of appealing to the conscience of each person so that no one could remain indifferent before the drama of poverty ad exclusion,” he wrote. Liberation theology took its name from Gutiérrez’s 1971 book titled A Theology of Liberation. In it Gutiérrez analyzed the situation in Latin America through the lens of oppressors and oppressed, insisting that poverty is always the result of sin, and proposed a political theology of change. In 1984 the Vatican doctrinal congregation headed up by Cardinal Joseph Ratzinger, under the auspices of Pope John Paul II, published an instruction titled Libertatis Nuntius, which was sharply critical of liberation theology—or “theologies” as some prefer to call it, given its numerous and varied expressions. Just two years later, the Vatican published a second text on Liberation Theology, titled Libertatis Conscientia. The 1986 text was issued as a complement to the first one and sought to “highlight the main elements of the Christian doctrine on freedom and liberation” as a corrective to the errors of Liberation Theology brought out by the prior instruction. Pope John Paul II, who lived for years under communist rule in his native Poland and was instrumental in the eventual collapse of the Soviet system, had no illusions about Marxism and its errors and went to great lengths to keep it from penetrating the fabric of the Church under the guise of Liberation Theology. In his role as doctrinal watchdog, Cardinal Ratzinger referred to Liberation Theology as a “singular heresy” and a “fundamental threat” to the Church. Pope Francis, on the other hand, while denouncing the underlying materialism of Marxism, has been somewhat more sympathetic to the socialist worldview. In early 2017, Pope Francis went further still, publicly defending Liberation Theology as a “positive thing” in Latin America. In a lengthy interview with the leftist Spanish daily El País, the Pope said that “Liberation Theology was a good thing for Latin America,” while also recognizing that it had “deviations” that needed to be corrected. The part of Liberation Theology that “opted for a Marxist analysis of reality was condemned by the Vatican,” Francis said. “Liberation Theology had positive aspects and also had deviations, especially in the part of the Marxist analysis of reality,” he said. In a remarkable 2015 revelation, the highest ranking Cold War defector asserted that the KGB had created Liberation Theology, exporting it to Latin America as a means of introducing Marxism into the continent. “Liberation theology has been generally understood to be a marriage of Marxism and Christianity. What has not been understood is that it was not the product of Christians who pursued Communism, but of Communists who pursued Christians,” Pacepa said.